1. They are extremely hard to anticipate -- and sometimes they're impossible to predict in advance (this is one reason I use other analysis alongside my Elliott Wave work). 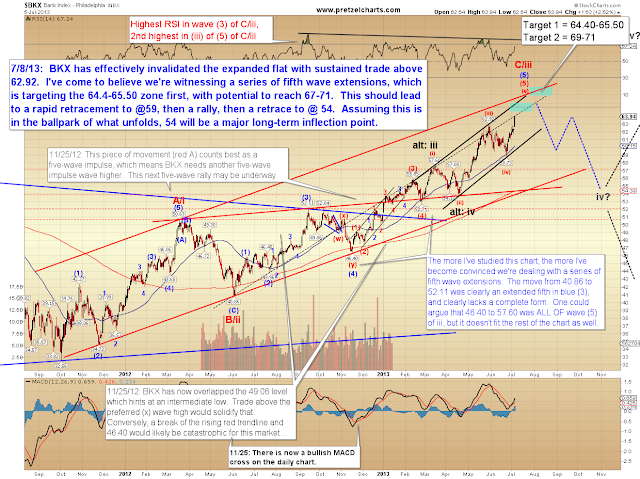 Extended fifths work like this: just when you think the fifth wave is about to complete, it launches in a parabolic. They are completely out-of-whack with the rest of the wave structure: often fifth wave extensions run a distance equal to 1.618 the length of waves 1-3 combined. This convinces most Elliotticians that the wave count is something else (normally, we assume it's a third wave). This then creates a situation where we're looking for fourth and fifth waves to unravel when actually there are none left to unravel. 2. 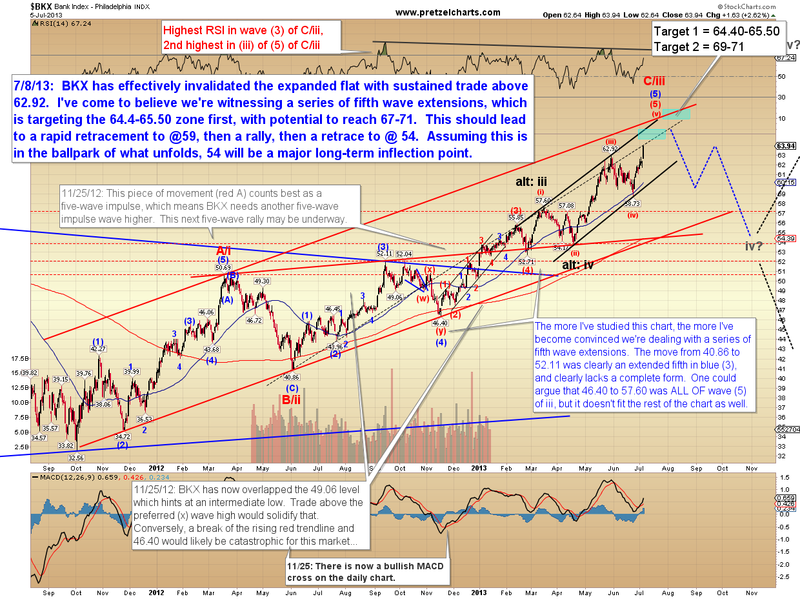 Further compounding that issue is fifth wave extensions often peak on high momentum, which leads classic technical analysts to continue looking for higher prices. As a result of these issues, extended fifths often catch people looking the wrong way on the way up, then looking the wrong way again on the way down. 3. The count has to be perfect, and I mean PERFECT to identify them. If you're off by the slightest bit, then you're dealing with another wave form. It becomes a game of micro-analytical-management, counting each wave at the finest level of detail, and then hoping you're not "a wave off" somewhere along the line. So I'm treading in difficult waters while going out on a limb -- in both my analysis, and in my efforts to mix metaphors. But, as they say, we can't break omelets without making a few legs. Or something like that. 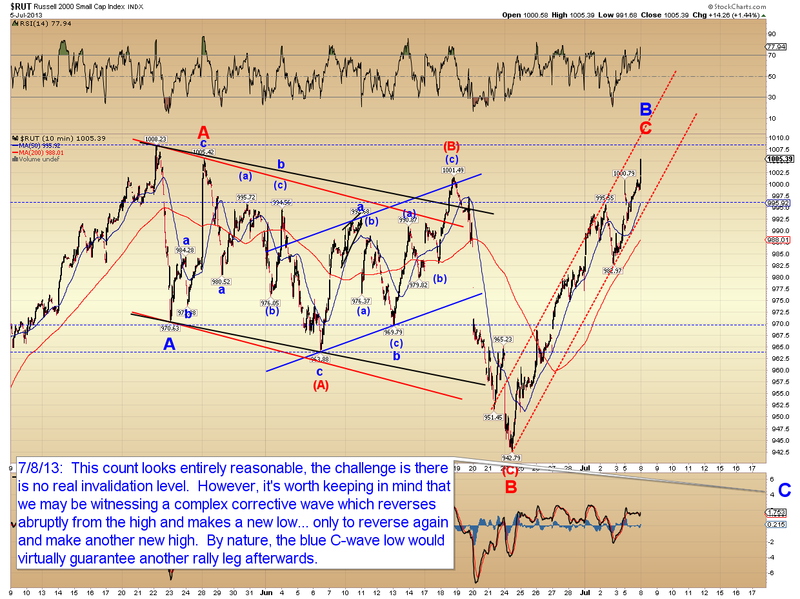 We'll cover the extended fifth wave count in more detail in a moment. 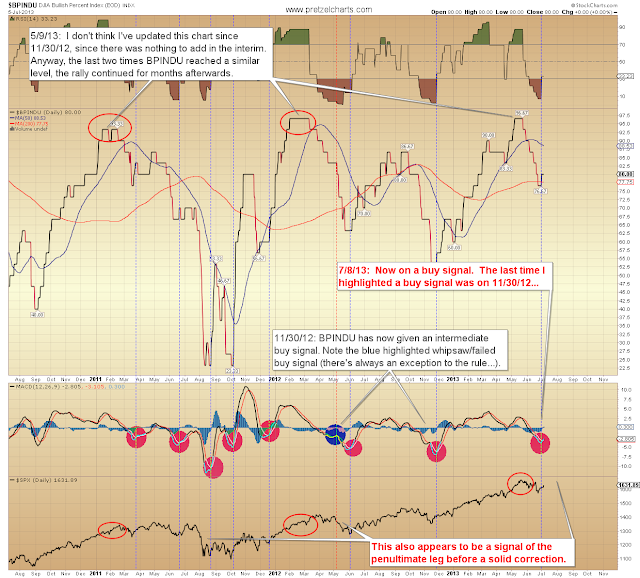 The charts aren't giving us much to be bearish about at the moment -- in fact, a number of indicators have flipped, or are about to flip, to buy signals. BPINDU gave its first buy signal since November 2012. Bears will need to reverse this directly if they want to keep hopes alive. 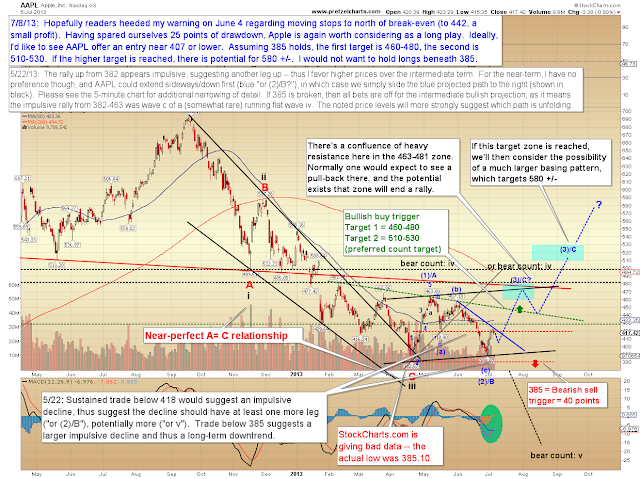 There is one off-beat potential wave count which does suggest the potential that an extended complex correction is still unfolding, and that this is a sucker rally. This is a possibility I've been tracking personally, and honestly, it is the best-fit for this wave structure in the Russell 2000 (RUT). 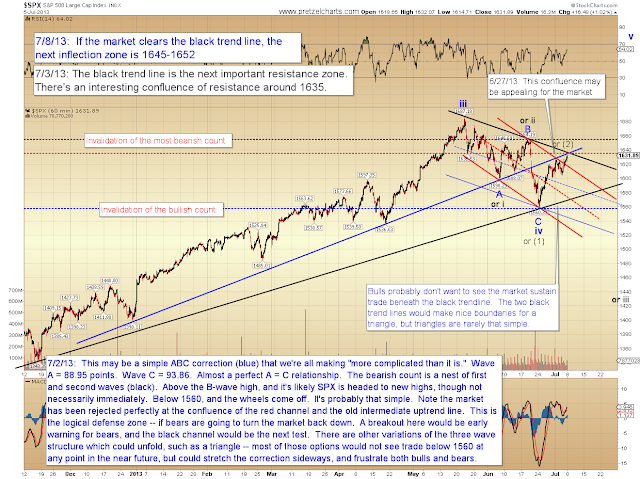 The messy three-wave move in the middle really doesn't reconcile very well as anything besides the count shown below. Accordingly, I think bulls should stay alert heading forward, as there may be an opportunity to buy back in at much lower prices. Incidentally, if bulls cannot reclaim 1008.23, then this could actually be a much more bearish pattern. 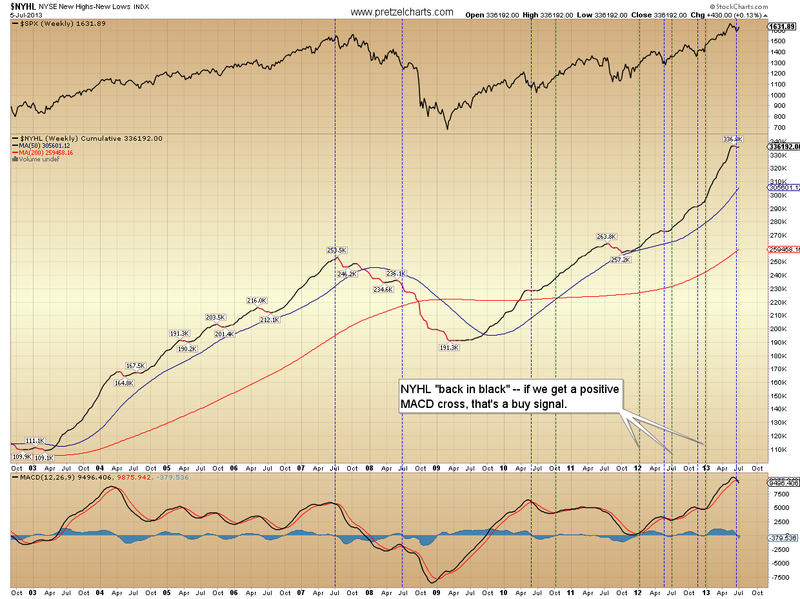 I'm assuming they will reclaim that level, which would imply a corrective decline -- but it remains to be seen. 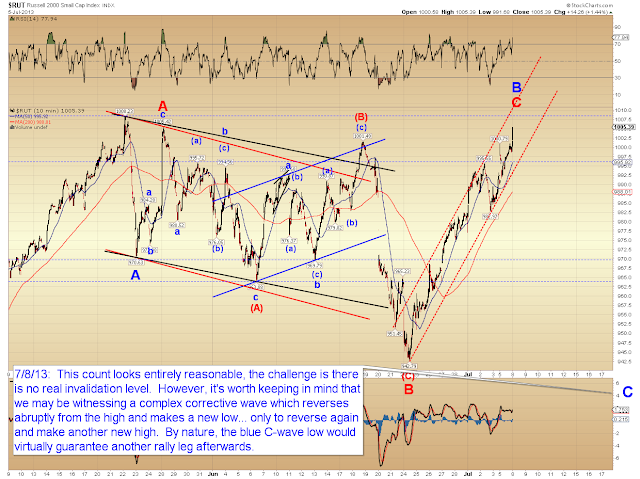 The bullish option is that the wave labeled as red B was the bottom of an inscrutable fourth wave correction. This wave count fits well when viewed on this chart in a vacuum, but I'm not certain how well it matches the indicators which are rolling bullish. 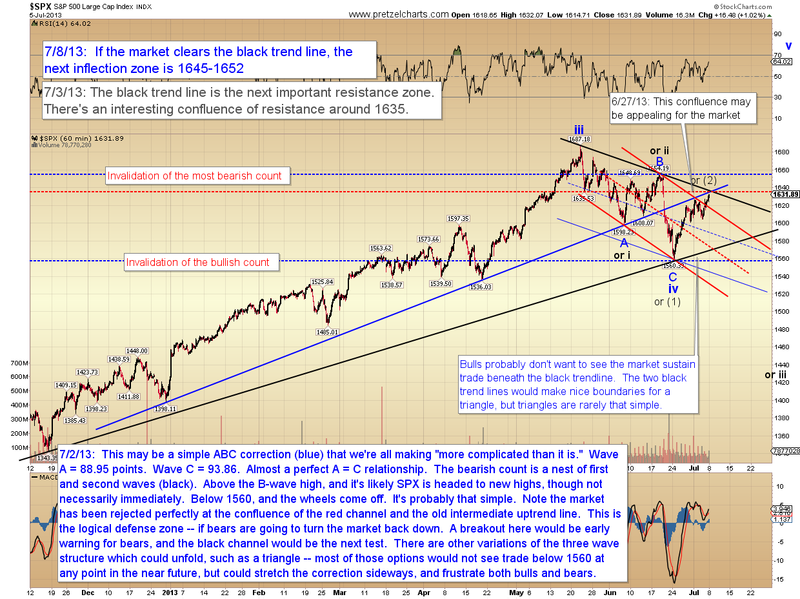 I think bears would need to reverse this rally early in the week to have a chance. For the near-term, the Philadelphia Bank Index (BKX) could be forming a similar pattern to RUT, or could continue into its target zone directly. For the long-term, I've become wholly convinced that BKX has formed a series of fifth wave extensions. 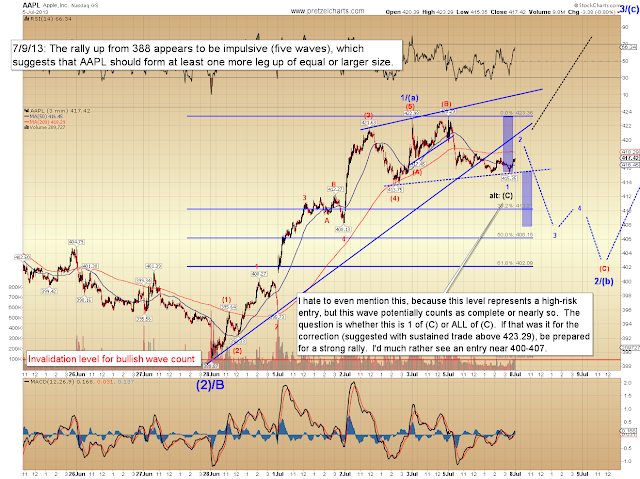 Apple (AAPL) is worth taking a look at again. 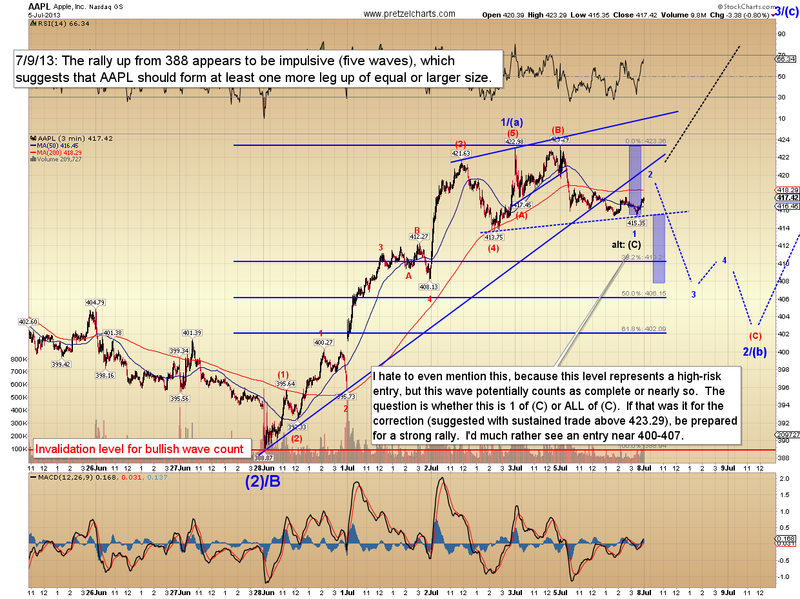 Hopefully readers heeded my warning from June 4 to exit if Apple traded below 442. 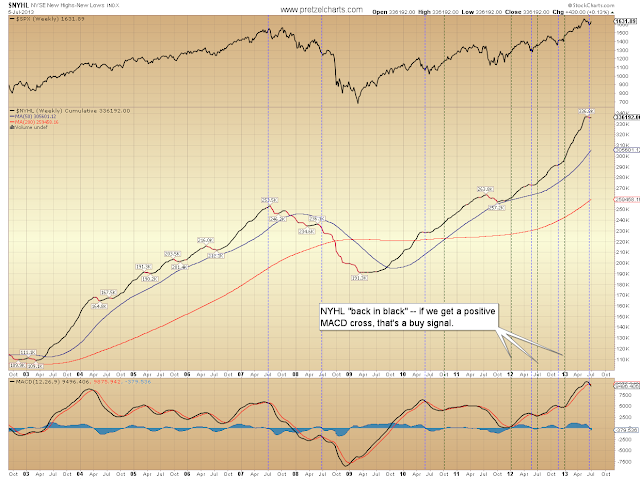 Not much to add for the S&P 500 (SPX). It appears we're going to test the previously-noted confluence. I still don't have a truly high-probability wave count here. My best-guess is that we're very close to wrapping up this leg. 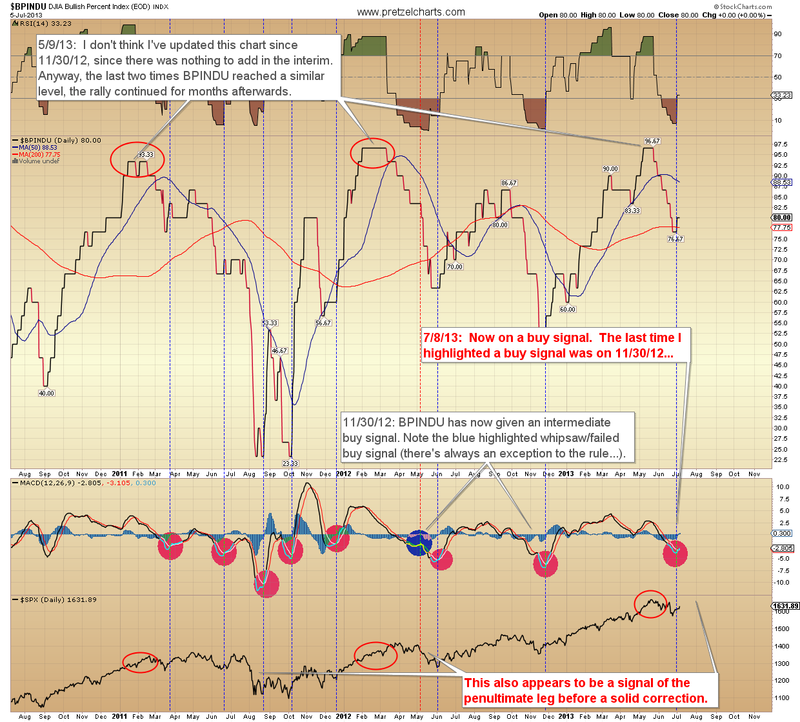 In conclusion, many indicators are now either on buy signals, or very close to issuing buy signals. Nevertheless, I'm not yet entirely sold on this rally just yet, and I certainly wouldn't be inclined to buy at current levels, as some markets are still flashing warning signs. This is one of the more difficult markets we've seen in a long time, so I would continue to urge only the lowest risk entries for both bulls and bears. Trade safe.